It was a busy and exciting day for the U7's especially for those that have come up through the micros and U6's, this was their first match against another club. 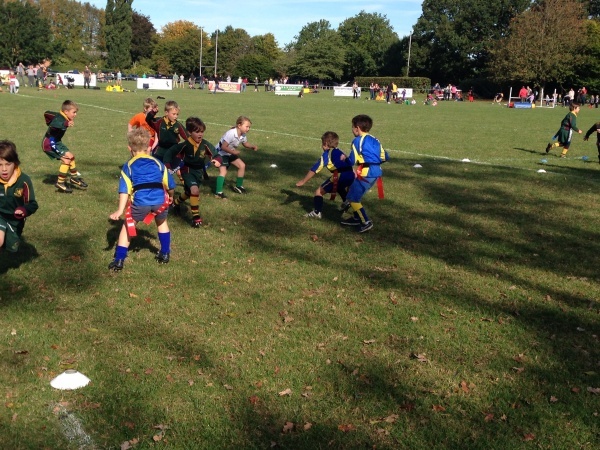 The U7's were split into two groups with one going to the tournament at Broadstreet, headed up by Darran, and the other staying at home to take on Kenilworth. Warm upThe session started with both OL's and Kenilworth doing separate warm up sets and then coming together to challenge each other at some some skill drills and an exciting session of bulldog. Kenilworth brought 10 players and OL's had 13 so we split into two matches. Both OL's team put in good match skills and received positive comments from the Kenilworth coaches with particular reference to good passing and team players making space. We would like to say a huge well done and high five to all the players both at home and away. As well as performing extremely well we are also keen to say how well behaved everyone was showing courtesy to the opposing teams.